Prevalence of gastroesophageal reflux (GER) increases during pregnancy, due to several factors like decreased lower esophageal sphincter pressure, increased intra-abdominal pressure secondary to the enlarged gravid uterus and alteration in gastrointestinal transit. 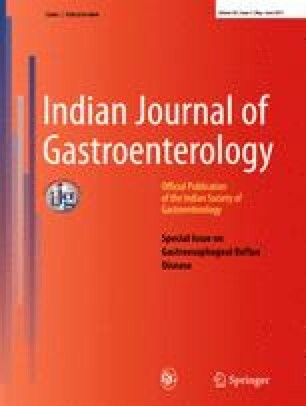 The present study aimed to determine the prevalence of GER in pregnancy in a southern State of the Indian subcontinent and determine the risk factors associated with it. Consecutive pregnant females (n = 400) at various stages of pregnancy attending the antenatal clinic or admitted in the antenatal wards were enrolled. Patients with heartburn or regurgitation or both (n = 182) for at least a week were defined as cases, and controls were those without these symptoms (n = 218). Data on demographic variables and symptoms were analyzed using Pearson chi-square, Yates corrected chi-square and Fischer exact test and student independent t-test as appropriate; p < 0.05 was considered significant. Demographic characteristics between cases and controls were similar. The mean age of cases (23.68±3.37 years) was similar to that of controls (23.25±3.31 years). The overall prevalence of GER was 45.5% (182/400), 77 (19.3%) had heartburn (GER-HB), 54 (13.5%) had regurgitation (GER-R) and 51 (12.8%) had both (GER-HB + R). Age and gravida did not influence the frequency of symptoms. Symptoms were more frequent in the second (43.1%) and third trimester (54.1%) as compared to the first trimester (9.5%) in pregnant women with GER (p < 0.001). Atypical symptoms were uncommon. GER was common among non-vegetarians (p = 0.02) and frequent aerated beverage users (p = 0.001). GER prevalence was high in pregnancy, often in second and third trimester. Non-vegetarianism and aerated beverages increased the risk of reflux in pregnancy. We thank Mr Vengatesan A, Lecturer in Statistics, Clinical Epidemiology Unit, Madras Medical College Hospital, Chennai, for statistical assistance.